Can you believe the year is almost half over?! As you go into summer planning mode, we’ve got some helpful info for you in this issue of The Idea Express. Give yourself a quick crash course on the most important trade show forms in your exhibitor manual with our special report. Also, get some ideas for your next booth from a client spotlight on a recent 20×30 island exhibit design. Need special event graphics? We can help you beyond the trade show floor! Which Form Is It Anyway?! If you’re new to trade shows or a veteran event marketer, this guide can help you get organized and navigate through the online exhibitor manual to find the most important and useful information about your upcoming trade show. Follow these real-life tips from our exhibit consultants, and you’ll a be much happier and successful trade show marketer when it comes to show time. 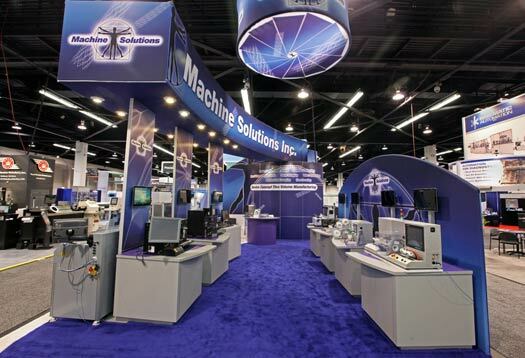 Last September, Machine Solutions Inc. (MSI), a Flagstaff, Ariz. process and testing equipment supplier to the medical device manufacturing industry, presented E&E Exhibit Solutions a formal RFP for its new 20×30 custom island exhibit project for MD&M West 2012 in Anaheim. The underlying challenge for the exhibit RFP was to showcase a technical product in a relaxed and people-oriented environment. E&E Exhibit Solutions returned the winning exhibit design, and MSI selected E&E as its custom exhibit solution provider. Learn more about E&E’s sister company, E&E Graphic Innovations, and our custom event graphics offerings.